Bumblebees and Butterflies: Panel 4 - A fossil hunter needs sharp eyes. 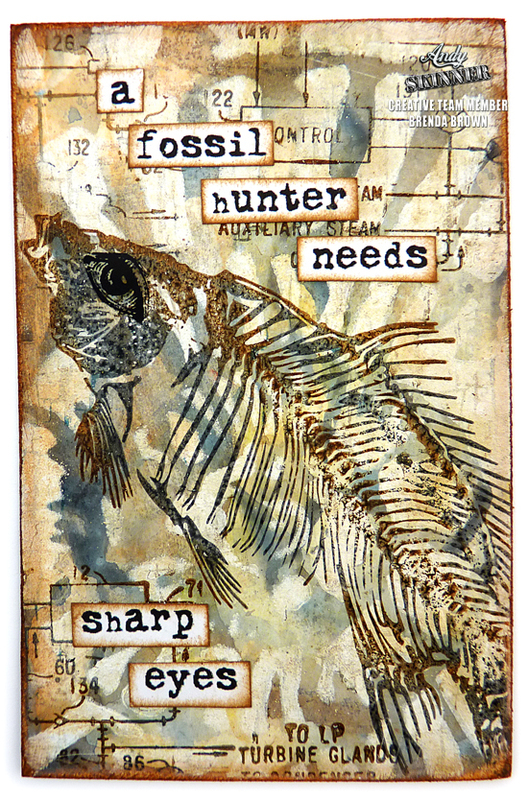 Panel 4 - A fossil hunter needs sharp eyes. 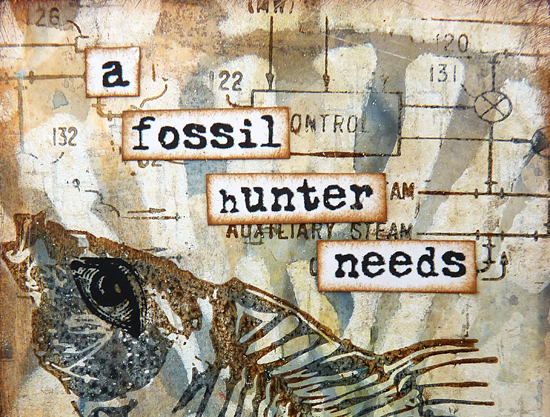 I think this is going to be one of my favourites from this set of fossil panels, I just love the way it turned out. I used Andy's large ammonite stencil on it and one of his older sets of stamps (Steampunk). 1. Seal the card with a layer of tinting base. 2. Using the dip and dry technique and watery washes start with raw umber - dry. Add a little cobalt blue to it, dip and dry. Add a little more cobalt blue and some titan buff, dip and dry. Add some titanium white to the mix and repeat. 3. Using the large ammonite stencil apply titanium white through it which leaves the stencil shape showing with those beautiful watery hues. 4. Give the panel a dirty wash of green gold, paynes grey and quinacridone gold. 5. Stamp the fish with watering can and coffee archival ink. 6. Stamp some text and diagram with the same colours. Can you see I added an eye to this one? 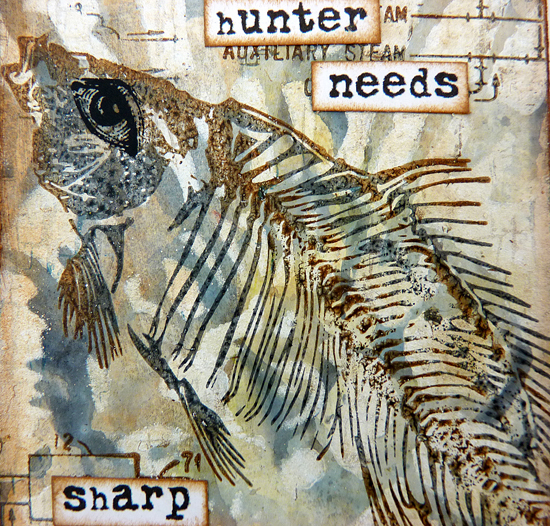 It is from one of the Tim Holtz remnant rubs sheets. I've worked out I need at least 15 of these panels for the journal I want to make so there will be quite a few to come yet - hope you're not getting bored of them. 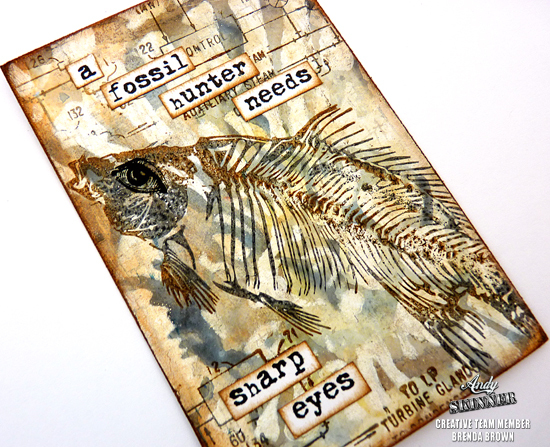 This fossil stamp is so cool! I love how you made your background. I love anything with fossils. Your stamped fish fossil with 2 different colors is very impressive. Thank you for all the details. Another wonderful fossil panel Brenda. your dirty wash technique is on my list of things to try. sure made this page look rich. and adding Tim's eye was a touch of genius! thanks as always for sharing. A fabulous panel, its going to be a wonderful journal. Wonderful panel with that super stamp. The eye is a clever touch and the background looks wonderful! I look forward to seeing more of these panels!